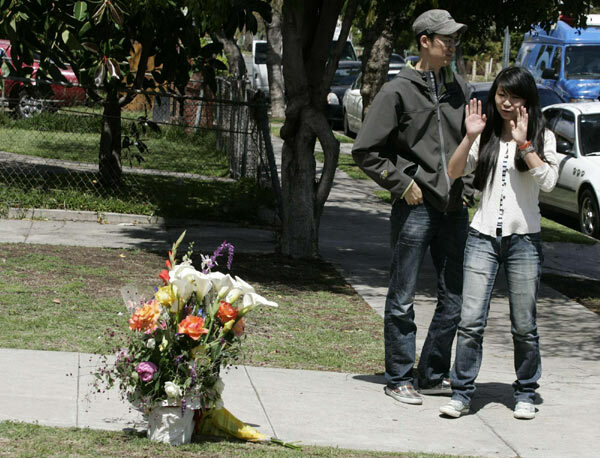 Two Chinese students shot dead in Los Angeles - video door phones,intercom system,video door phone,modules.CCTV. LOS ANGELES - A gunman opened fire on a BMW near the University of Southern California campus on Wednesday, killing two international students from China in what may have been a bungled carjacking attempt, police said. The gunfire erupted around 1 am local time, shattering the windows on the new 3-series luxury car. The woman was slumped in the front passenger seat, and the man was found outside the vehicle. They were both dead on arrival at a hospital, authorities said. Investigators say it may have been a carjacking attempt. Witnesses said the car was in the roadway, not at the curb, at the time of the shooting. "This is every parent's nightmare," police Cmdr. Andrew Smith said. The gunman fled and no one has been arrested, Smith said. Police have taken the $60,000 BMW away for examination and were attempting to determine if there were any surveillance cameras in the area. Smith said the names of the 20-year-old woman and the man, who was also in his 20s, were being withheld until families are notified. Chinese college students have helped fuel record international student enrollment on US campuses in recent years. Students from China represent nearly one-fourth of the nearly 724,000 international students attending colleges and universities in this country. At USC, nearly 35 percent, or 2,513, of the school's 7,226 international students are Chinese, according to the university's 2011 figures. The school, with 38,000 students total, has the largest number of international students of any US university. The USC Department of Public Safety sent an email alert to students, saying that two people were shot in front of a residence. "The female victim has been identified as a USC graduate student," the alert read. "Los Angeles Police Department responded immediately to the scene and the victims were taken to California Hospital where they were pronounced dead." "The circumstances surrounding the shooting are unclear," the alert said, adding, "As the university mourns this tragic loss, DPS urges students to be mindful of their surroundings." USC is in an urban center not far from gang-infested neighborhoods. But gentrification has begun in the neighborhood. Beatriz Moreno, who lives across the street with her family from where the shooting occurred, said the neighborhood has been cleaned up. The last shooting she could recall was in 2003. "We used to see this every day," Moreno said. "There are mostly families here. This is not normal."